So, I had planned to kick off the new year with a recent recipe for a coffee based drink inspired by a favorite drink of my favorite fictional assassin that I made for the first time recently to high praise from someone what is arguable a bigger fan of both coffee and Vlad Taltos than I, which is saying something. While that post will be coming, you’ll have to wait until next month, as inspiration for another drink hit me today. As I was driving in to work this morning, I was struck by an idea for this cocktail. As to what it says about how things are currently going at the office that I was thinking of cocktails before my work day had started, well, I’ll leave you to draw your own conclusions. 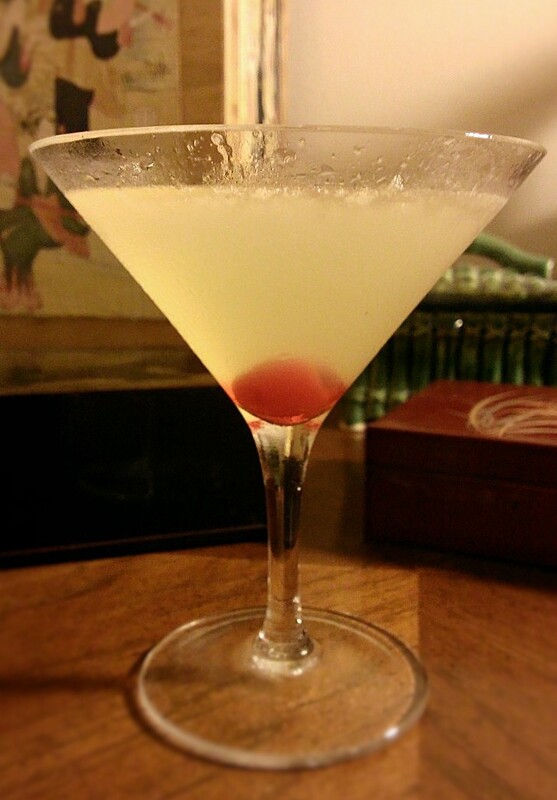 The point is, I was thinking of absinthe in particular, and how maybe a nice Corpse Reviver #2 would be a good way to celebrate the end of the day once it shambled around. Now, I love the Corpse Reviver #2, but of course my mind started working through permutations of it, and what it was about that drink that I was craving. Upon arriving home, I told my darling wife about this cocktail idea, and shared that I even had a name for it already, which is surprising as I usually struggle with naming my creations. After telling her about the idea, she shared that thanks to a trip to the grocery store earlier today, we had some nice fresh apples in the fridge, which I took as a sign, and set off to cobbling this first experimental glass. I must say, I am well pleased with the results, if I do say so, as was the wife. I started by thinly slicing up some apple, in this case a Kiku apple, which is a variety we hadn’t tried before. Honestly, I couldn’t have asked for a better apple for this cocktail; it’s quite juicy, very sweet, but with a nice light tartness. After cutting the apple into suitably thin pieces, I muddled that in a Boston shaker with a bit of fresh lemon juice, about what you’d get from 1/8th of a medium lemon. I kept muddling until I had worked as much juice out of the apple pieces without completely pulverizing them. To this I added some crushed ice, the applejack, absinthe, and after sampling a bit more of the apple and deciding it was going to make for a decently sweet drink, the small amount of simple syrup. I shook the drink briefly to chill it and let some of that crushed ice melt down, and then strained it into a coupe glass for service. What I had in that glass was a lovely little drink; very light, with an almost floral sweetness from the apple, and the nice clean finish of absinthe passing fleetingly through the end. Tonight I officially start a much needed vacation. In celebration, I decided I needed a tasty libation, and one that would serve as a bit of pick me up after a tiring week of trying to make sure everything would be covered while I’m out of the office for the next week and a half. What better than a Corpse Reviver #2? The Corpse Reviver #2 is perhaps the best known cocktail from the Corpse Reviver family of drinks. Recorded in Craddock’s famous Savoy Cocktail Book, this drink is meant to be a hangover cure. While I’ve tested having this drink after a particularly hard night of over imbibing, I don’t know if it’s particularly effective for the purpose, but it is a tremendously drinkable, and subtly complex cocktail nonetheless. Made from equal parts of nearly all of the ingredients, I suppose one should expect a fairly balanced drink, but this is one of my favorite classic cocktails for how marvelously well balanced it is, and how well each ingredient plays off the others. The sweetness of the Cointreau balanced by the dryness of the gin, played against the tartness of the lemon juice, the slight oily note of the Lilet cut by the other three primary ingredients, all capped by the cool bite of the absinthe which seems to heighten each other ingredient’s more subtle flavors somehow. After a good shake, strain into a chilled cocktail glass, or coupe if you like, optionally add a maraschino cherry, and enjoy. A note on the absinthe: some add it to the shaker, others rinse the glass with it. I typically prefer the latter, as I find it makes the aroma of the absinthe a little more pronounced and present in the drink, but then I am a great drinker of absinthe. By adding it to the shaker with the other ingredients, you may find it a little mellower, which is a perfectly acceptable option if you’re not a huge fan of absinthe. 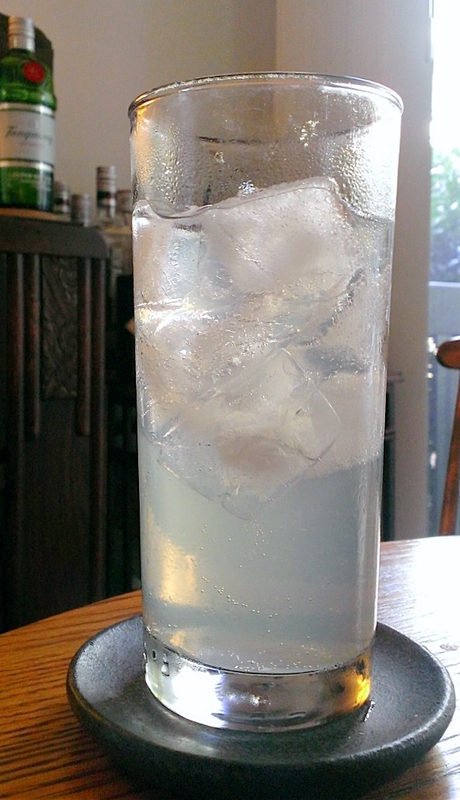 For the gin, I chose the wonderfully dry Leopold Brothers offering for its clean, strident taste, but I’ve made this drink with probably close to a dozen different gins and been pleased each time, though I do prefer this with a drier gin typically. While we’re talking about the specific ingredients let’s talk about substitutions. If you can’t get your hands on Lilet Blanc, but can find Cocchi Americano, that’s a perfectly fine substitution that won’t tremendously alter the profile of the drink. For the Cointreau, often times recipes will suggest using triple sec as a replacement for Cointreau, but I really can’t recommend it in this drink. As I mentioned in my post about the Sidecar, triple sec is sweeter than Cointreau which this drink doesn’t want, and less flavorful, which will unsettle the wonderful balance of this drink. For that reason, I do implore you, don’t substitute triple sec in for the Cointreau here; the difference is subtle but it is noticeable in my opinion and not in a good way. While switching out the Cointreau for triple sec isn’t a huge sin, using bottled lemon juice in place of the fresh most definitely is. You’ll lose the crisp citrus flavor, and instead find acid in its place. A key to making great cocktails, just like great food, is using fresh, flavorful ingredients, and you should always be using fresh citrus if you can. I used to occasionally pre-juice citrus for the next few days, but stopped because I found that I’d let a couple days turn into a week or more, and the longer you let it go, the more the flavor changes. Nowadays, I only juice citrus in advance if I’m going to be making a large number of drinks that day or the following perhaps, and don’t want to be stuck juicing between every drink I’m serving.